Welcome to Patchwork Designs Inc.
has had ALL of its Embroidered Emblem Manufacturing Materials tested by an approved independent testing Laboratory including All Thread, Fabrics, backings, and has passed all of the tests for the below harmful chemicals. 2009 Consumer Products Safety Act re. Lead & Phthalate DBP, DDP & DEHP in Product Contents. Welcome to Patchwork Designs, Incorporated. We create embroidered patches, patch programs, activity kits, and embroidered merchandise for scouting, schools, historical buildings, museums, organizations, and special events. 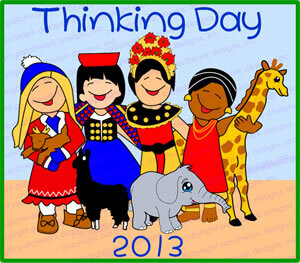 Use our rubber stamps to create swaps, stamp passports, t-shirts, bandanas, hats, tote bags, etc. Click on each country below to view the stamp. WE CAN CREATE A SPECIAL STAMP JUST FOR YOU. WOODEN ONE INCH RUBBER STAMP. 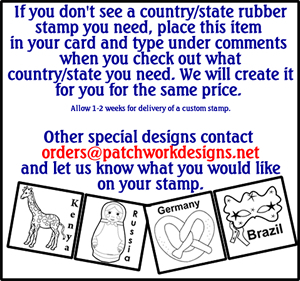 If you don't see a country/state rubber stamp you need, place this item in your card and type under comments when you check out name the country/state you need. We will create it for you for the same price as the instock country stamps. Allow 1-2 weeks for delivery of a custom stamp. Other special designs or logos on stamps contact orders@patchworkdesigns.net and let us know what you would like on your stamp or send us an image. Order this booklet and all the patch programs we offer will be at your fingertips. OVER 150 pages of information! Order this patch after you learn about your country! Only $1.35 for over 50 pieces purchased. Each book/kit represents the laser cut patch of the doll that you wish to take on an adventure.